» TODAY ON FRANKLY SPEAKING – WHAT SETS YOU OFF? TODAY ON FRANKLY SPEAKING – WHAT SETS YOU OFF? Life does not often deal you the hand you deal in many matters and for many reasons. Growing up, we were usually taught to be good, to be kind, to be responsible and fair. We were told we shall reap what we sow and that if we are kind to people, people will be kind to us because usually in life you reap what you sow. Hmmm. Till today this admonition is still very popular and useful. At all levels and in every social circle, people are encouraged to do good deeds and do the right things as the good they do is what they shall definitely and eventually reap. I sincerely appreciate this philosophy and preach it as well. But frankly speaking in my few years of sojourn on this planet, I have come to learn that in this life, sometimes bad things happen to good people and good things happen to bad people. Life can be subjective and complex at times. Life can also be very confusing and I have come to accept and adopt a principle that even if it’s just for the purpose of honor and a good name, I will always do the right thing. What this decision has brought me is a good conscience, peace with me and peace with my maker. I sincerely think if it’s purely on the account of reaping what you sow alone many of us would be discouraged because many bad people appear to be getting away with their wickedness and living very long and many good people appear to be victims of wicked wiles and are being cut off in the prime of their lives. As mere mortals there is so much we don’t know, can’t see or understand. Because we are human, we have our frailties and thresh hold for pain, subsequently, it gets to that point when we begin to react to all the hurt and wickedness people and the society hurls at us. We try so much to exercise patience on so many matters but it gets to that point when we become absolutely frustrated and we’re forced to react. At a point in time, every man reacts. Incidentally the most likely emotion to find expression when we’re absolutely frustrated is anger, anger! Generally speaking, some people at times can come across as very annoying, situations can be annoying and there are times when you get angry at you. This means the situations, behaviors and factors that make you angry may be beyond human control as even you do things that annoy you! The awkward aspect of all this lies with the fact that most of the time it is people you are close to or relate with that make you angry. Anger usually comes through interaction and frustrated expectations. Husbands get angry at their wives over frustrated expectations or disappointing behaviors. Wives also get angry with their husbands the same way. Parents get angry at their children; children get angry at their parents, subordinates at their bosses, bosses at their subordinates, citizens at their governments and even the governments get angry with the citizenry. You most often get angry at people you’re close with and have expectations from. Let me tell you a story, when I was about 10 years or 11, I can’t really remember now, we used to live in an estate and in that community, there were several other children my age mate and we used to play together so much. We were so free we ate at one another’s houses and played football and other games together. You know how it is in an estate, you would go from house to house borrowing and lending videotapes and watching movies in any of the houses, when we get tired we go out within the estate to pluck fruits like mangos and guava and all that; it was just a typical estate with lots of kids of about the same age bracket; 9 to 13 and we were almost 15 in number that played together both male and female that fell within that age bracket. One day, one of the parents suddenly discovered her money had been stolen; 1,800 naira precisely, then it was a lot of money. She searched everywhere but couldn’t find it and concluded probably one of the many children in the neighborhood must have taken the money. By way of precaution to recover the lost money she went around the estate to inform every parent to be on the lookout in case any of their children starts buying stuff and bringing home stuff the parents know nothing about the source of money for purchase. I mean it was just precautionary and she actually went to every house and reported to every parent. My father of all the many parents she informed about the incidence was the only one that reacted or should I say overreacted. Because he was a very religious man and had a pious reputation he couldn’t handle the fact that someone had actually come to mention to him to observe his son over a theft incidence. My father called me outside and his upset was why should I even be mentioned or suspected in such a situation? His main concern was his religious reputation; he went on ahead and began to flog me to pieces in the presence of other children in the estate. He flogged me till he was tired and everyone even began to suspect I stole the money. I was very, very pained and hurt. I did nothing wrong, I was just a child playing and interacting with other kids in the neighborhood the way every normal child would behave, I was about 10 years old going on 11, I felt he was just being wicked. Two days later, this woman came back to inform my dad she had found the money, it actually fell through the tiny space between her bed and the wall to the floor in her bedroom. She thanked my dad for his support and went home. I had thought my father was going to at least apologize to me and be remorseful but he didn’t and guess what, for 25 years I didn’t forgive him for what he did to me. For 25 years I kept planning and plotting on how to hurt him back badly for what he did to me but luckily for him, God took over my life and I forgave him. Of all negative emotions the most destructive of all is anger! Anger is triggered by pain or a perception that someone is attacking or hurting you or taking advantage; it’s caused by frustrated expectations. Anger is from within, it comes from the person you are, not from what people say or do, no one or nothing makes you angry, nothing can cause you to feel angry, it’s a response you choose, you can respond in a calm, positive manner or with anger. Most times you get angry when you feel victimized, oppressed or being dealt with unfairly; it’s a perception thing, if you get angry repeatedly, your resistance to anger becomes weaker and weaker and you become angry faster and faster. Anger becomes your automatic response to any perceived problem. In my life so far I’ve seen a lot of hurt and pain. I’ve experienced the worst form of rejection, betrayal, emotional and psychological abuse, I’ve been cheated, lied to, embarrassed and disgraced by many people that I loved, respected and trusted with my life. I’ve witnessed several religious and ethnic conflicts growing up and many close friends and family members were slain and burnt to death by the same neighbors and friends we’ve lived with for years purely on the account of tribal and religious differences. I know hurt, oh I know hurt and I’m very familiar with pain, severe pain caused by people close and familiar. Consequently, I became a very angry person and I was constantly an angry fellow. But today, I know better that I’m doing more harm than good to myself holding on to my anger and animosity, I had to and must let go everyone and experience if I want to stay alive, happy and well. Recently I was reading a medical journal on anger and I learnt that the outburst of anger can cause heart attacks, strokes, burst blood vessels, ulcers, migraine, headaches, asthma and even skin disease. Can you beat that? 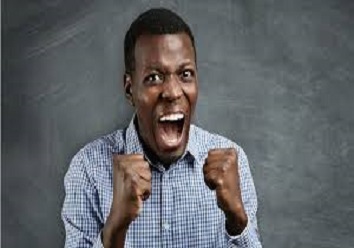 Dear friends, uncontrolled anger destroys marriages and relationships, destroys personalities of growing children, it can make you lose your job and can destroy your career; it can chase away profitable clients and customers and will surely bring you more unhappiness than any other emotion. My dear friend, as we plan to make this New Year a profitable, rewarding and happy one, I’ll suggest you make that deliberate effort to deal with anger in your life. You must resolve to interpret the action, attitude and behaviors of others differently. Don’t see you as the victim; see them as the victim of their personal weaknesses. Rise above disappointing attitude and behavior, chose to ignore and retain your peace and happiness. My dear friend, what sets you off? Deal with it, enjoy your day. GREAT NEWS! YOU CAN NOW SELL YOUR PRODUCTS EASILY IN FOREIGN OUTLETS! HOW TODAY’S BUSY PARENTS RAISE GREAT KIDS? – A one-day seminar! TODAY ON FRANKLY SPEAKING – THE ART OF CREATIVITY. TODAY ON FRANKLY SPEAKING – I DID IT. Misan Megho on HOW TODAY’S BUSY PARENTS RAISE GREAT KIDS? – A one-day seminar! Lawal Azeez Olayemi on TODAY ON FRANKLY SPEAKING – TRAP OF DIMINISHING INTENT. © 2019 muyiwaafolabi All Rights Reserved.